Why Did We Create This Profile? Powerful visuals evoke emotions, make for deeper engagement and can effectively convey complex ideas. For this project, WITNESS and El Grito de Sunset Park profiled one officer from the 72nd Precinct to show repeated abuses over time in the context of additional data points. We created a timeline with videos from the collection alongside other publicly available details, such as salary information, legal documents and media reports. The timeline videos represent a small selection of the collection. We chose to curate videos that had already been made public because of challenges with the verification of incident details, limited access to data about incidents of misconduct, and securing consent from the victims. The collection does contain other videos showing officers acting violently – but many of the unpublished videos show aggressive searches, crowd control and intimidation. El Grito is planning to continue creating additional officer profiles using the videos in their database. This project offered an opportunity to collect, organize and review all of these videos in aggregate. While the scope of the collection was too limited to see widespread patterns of systemic abuse, we did see repeated aggressions by specific officers and the day-to-day pressure, surveillance and tension that many Sunset Park residents – most often people of color – faced on a regular basis. In the absence of a comprehensive database about NYPD police misconduct, this project explores how civic video and open-source data can corroborate incidents of abuse and develop narratives that go beyond a single video. Vincent Ciardiello was profiled because he appeared multiple times in the videos we watched, in the media and court documents we read, and in the stories we heard from activists. He was known in the community, by legal services providers, has been subjects of negative media reports, and yet is still on the force and receive regular raises. Ciardiello was not the “worst of the worst” in some of the videos we viewed, nor was he alone in acting violently or aggressively, but we chose to profile him to show an example of an officer with multiple incidents documented over time. El Grito is will continue to create additional profiles of officers documented in their database. The videos included in this profile have played an important role in investigations, media reports and getting wrongful charges dropped for some victims. 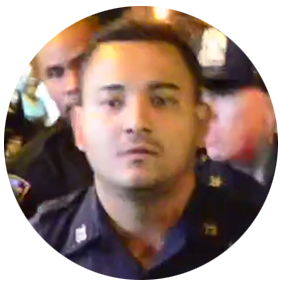 For example, videos taken during the Sunset Park Puerto Rican Day Parade in 2014, show Officer Ciardiello violently arresting a 17-year old who was filming the police. The youth suffered head injuries and was charged with resisting arrest, attempted assault and attempted grand larceny. Eventually his charges were dropped and he sued the city, naming Ciardiello, among others, in the suit. Another video, documented just a few months later, shows Officer Ciardiello kicking a 22 year-old street vendor as he was handcuffed and laying on the ground. 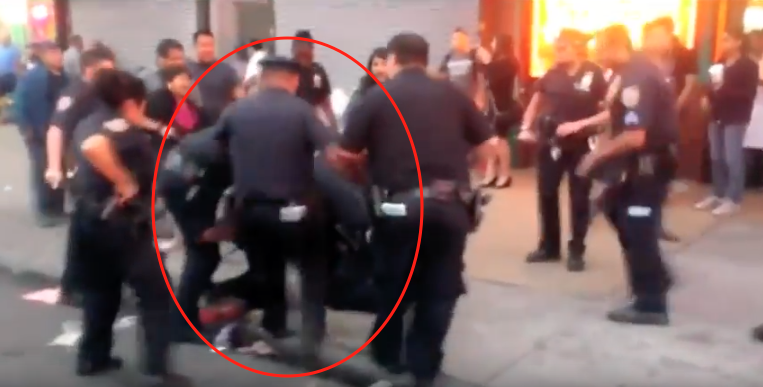 The eyewitness video, published on the Facebook page of El Grito de Sunset Park, helped the case become highly publicized and the officer was suspended during the investigation. Still from eyewitness video of Officer Ciardiello kicking a 22-year old street vendor in the back. Law enforcement officers are public servants and their salaries and overtime are funded by tax payer dollars. In New York State, payroll data is some of the only information made publicly available about individual officers. Although the dataset for this project was too small to identify clear patterns, we included salary and overtime information in the timeline to show that the officer we profiled received above average pay in fiscal year 2017, despite repeated documentation of aggressive behavior in past years. For example, in fiscal year 2017, Police Officer Ciardiello’s total compensation was over $127K. According to the Citizens Budget Commission, the average total pay for Police Officers in 2016 is around $90K. Though overtime can be granted to officers for a variety of reasons, it can be useful information to collect in an officers profile. For example, the media has reported NYPD overtime abuse scandals numerous times. A recent report by the Daily News claims that cops who are put on “modified duty” due to corruption or misconduct cases, often receive a significant bump in overtime hours to increase their base salary. While many saw this as a positive step, the individual officers responsible for the abuses were often not held accountable or were minimally disciplined. For example, Ciardiello was never charged with assault for his actions against the street vendor. Usually it would be hard to know what disciplinary measures were taken because of New York State’s Section 50-a, which prevents public access to police records, such as disciplinary history or performance reviews. However, Buzzfeed News recently released a trove of leaked NYPD misconduct records, which indicates that Ciardiello was suspended for 30 days and then placed on Dismissal Probation for one year, despite a suggested penalty of dismissal from the NYPD. Officer Ciardiello is still on the force, though he was moved to the 88th Precinct where he is now a Neighborhood Coordination Officer. Moving officers to different precincts is common, and because of limited transparency, it’s difficult for residents to find out about an officer’s past conduct or reputation. This is a key reason why civic journalism and local organizing are crucial to informing and protecting communities. Victims of police violence do not receive the same level of privacy or support as law enforcement and they rarely see justice in a court of law. They are often dragged into the media spotlight, criminalized by news reports or their stories are discredited or ignored. Even if a victim’s charges are dropped, they still have to deal with legal paperwork, fees, court dates and/or medical bills. Similarly, people who film and share video of police misconduct often face threats and harassment online and offline. These incidents, and the daily harassment and surveillance of residents in heavily policed neighborhoods can have lasting trauma on victims, their families and communities. 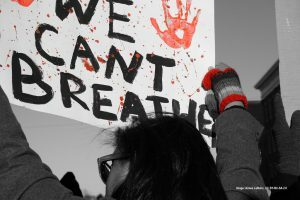 Lack of transparency, alleged harassment against filmers and above-average salary increases are also issues we see in the well known case of Eric Garner. In 2014, NYPD Officer Daniel Pantaleo was caught on camera putting Garner in an illegal chokehold – allegedly for selling loose cigarettes – killing him in Staten Island. The video went viral and catalyzed movements around the world calling for accountability and an end to systemic racism and police brutality. Ramsey Orta, a friend of Eric Garner’s who filmed the incident, faced online and offline harassment after he released the video through the Daily News. Not long after the video was released, Orta was arrested on “unrelated” charges, and is serving time in prison where he continues to face threats to his life. After the video went viral, Orta told Time that if he had to do it again, he would release the video anonymously. Despite the clear video evidence and an autopsy that deemed Garner’s death a homicide, a grand jury declined to indict Pantaleo. He still works for the NYPD. Activists recently brought attention to the fact that he and received a nearly $20,000 raise in 2016. He also reportedly saw a big jump in overtime pay after the incident. Eric Garner’s death was not the first time that Officer Pantaleo was involved in misconduct. Leaked documents from the Civilian Complaint Review Board show that there were at least 14 complaints against Officer Pantaleo prior to the killing of Garner. These documents had not been seen previously because of a court ruled that publishing them would be a violation of Section 50-a. As groups like the New York Police Union push for protecting police body camera footage under 50-a, it is worth considering how differently this case would have gone if it was captured by a police body camera instead of eyewitness video. It’s very likely that Eric Garner’s death would not have received so much public attention. Tragically, in December 2017, Erica Garner, the daughter of Eric Garner, passed away due to complications after childbirth. However, many believe that the role she stepped into as a fierce activist following the death of her father took a severe toll on her and contributed to the decline of her health. In short, the trauma inflicted on and experienced by individuals and communities who live through police misconduct has very real impacts on their family members, friends and communities. Upon reviewing the case of Eric Garner, we found similarities with the cases and officers profiled in this project. The violations of Officer Ciardiello are less violent than Pantaleo, yet he has also been accused of misconduct multiple times, given limited disciplinary measures, received salary increases and overtime bumps. Likewise, the victims, their families and several of the eyewitnesses filmers have faced further harassment and trauma related to these incidents. While the collection of videos analyzed for this project was too small to assert claims of widespread patterns of systemic abuse and impunity, the process we engaged in points to new methods and approaches for creating larger and more robust datasets. Ultimately, we hope this project offers new ideas for collecting, analyzing and curating video and data to help connect the dots, expose systemic complicity, and tell more compelling stories around police brutality. WITNESS makes it possible for anyone, anywhere to use video and technology to protect and defend human rights. See It. Film It. Change It.